The third thrilling misadventure of Captain Jack Sparrow! I've never been a big fan of the POTC films because they are so convoluted and over long. That's a shame since they have a lot of fun moments. So with these edits I'm hoping to keep all the fun, the humour, the silliness and the spirit of high fantasy adventure and as keep as little of the plodding exposition and turgid plotting as humanly possible. I've renamed AWE 'The Song of the Brethren Court' as the original title was pretty uninspired for an adventure film. Also the film has been recoloured shot-by-shot to bring it into visual-continuity with my fanedit of DMC, boring exposition scenes have been slashed, scenes have been reordered to flow better, Two deleted scenes have been restored, a new beginning has been created and Will and Elizabeth are still in love from my first edit. ...for their input and encouragement. 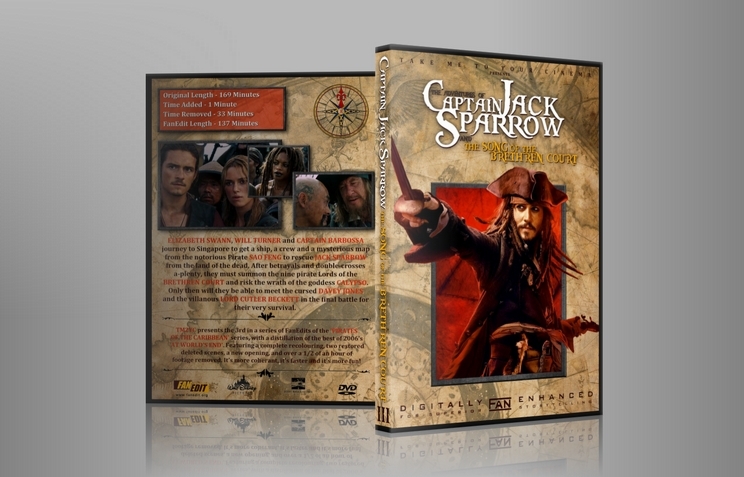 A menu is included on the DVD. Please note that due to catastrophic technical problems at the 11th hour (See fanedit thread) the visual quality of the render is not what I had hoped it to be (Up close). It looks more SD, than the HD edit I had prepared but still totally watchable. - Recoloured film throughout to tone down the depressing greeny-brown hue. I intended to bring in the cartoonish vibrancy of DMC and create some visual variety. - Old beginning removed and replaced as I thought it was completely unsuited to start a light-hearted adventure romp. Featuring as it does, visual refrences to the Holocaust and a child being hanged. Instead we are reintroduced to the threat from Beckett that concluded my last edit. - Removed Jones visiting Calypso scene. It was a nice scene but made no sense. If Jones could get into Shipwreck Cove this easily, why was he waiting outside? Now, this was the hard one. The bloated, extremely long, non sensical third entry in the POTC franchise. And TM2YC makes it work somehow. Even if some scenes seem to randomly jump from one situation to the next somewhat abruptly; he is still able to deliver a coherent edit; yet it still falls quite short in comparision to Curse of the Black Pearl. I understand that there's so much you can do with the source material. And that the whole nonsense of the Pirate King and Pirate Council can't be removed; which the overall narrative is impossible imposible to truly fix. I believe that TM2YC did the best that could be done. As usual, a 2.0 audio track deducts points from A/V quality. Before watching TM2YC's The Song of the Brethren Court I reluctantly watched the previous fan edit, The Heart of Davy Jones (reluctantly because I really liked Dead Man's Chest) and even though the problems I had with Dead Man's Chest was fixed, more problems came as well and ultimately I had the same feeling with The Heart of Davy Jones, just different in a few details. I later edited my review a few times until I had a final verdict (just a few minor details) and then I stated if The Song of the Brethren Court wasn't as good as I hoped (because At World's End was terribly disappointing), Dead Man's Chest would remain in my shelf and I would edit my own version of At World's End (probably with the name Pirates of the Caribbean: Gathering of the Seven Seas (of course I would ask Radzinsky for permission to use that title if I would do the edit)). However if it was as good, The Heart of Davy Jones and The Song of the Brethren Court would replace Dead Man's Chest and At World's End on my shelf. And you know what? It was! First, the technical aspects. In my review of THODJ I said the color correction highlighted the green seas and skies. In TSOTBC however the color correction was PERFECT. The color was just like DMC's/THODJ's vibrant colors, and there was no odd color. The editing was done perfectly as well, if there was any abrupt cut it was either unescapable or I didn't notice it. The other problem I have is the redundancy of E.I.T.C. in the beginning. Mercer (Beckett's henchman), some soldiers and his spies have learned about pieces of eight and tells Beckett about the Court. Okay, then why are there still E.I.T.C. soldiers roaming around in Singapore? It still works, it's just too weird. However, those 2 problems I have are overshadowed by the numerous removals, movings, recuts and trims, making a worthy successor to Dead Man's Chest/The Heart of Davy Jones. Gone is the love triangle continued from DMC! Gone is the terrible humour! Gone is the annoying CG-Jacks and Mini Jacks! Gone are lots of unnecessary boring scenes! My only other problem with this movie (not this edit because TM2YC done everything he could to improve this movie (and he succeded)) is that it's still a disappointing entry to the franchise. And no, I'm not saying this is still a bad movie, or that it's a disappointing fanedit. I mean that DMC promised an action packed, no exposition war, but in the real version we had politics, unnecessary exposition (along with important ones too of course, but mostly unnecessary) and middle fingers to the audience. What I wanted with AWE was Return of the Jedi to the Pirates movies. But instead we got a dead Kraken. If this was released in theatres I would give it a 6/10. But as this is a fanedit and not much could possibly be changed for bad movies, I give the fanedit a 9/10. Definitely recommended! After watching the previous edit in TM2YC's "Captain Jack Sparrow..." series, the superb "...Heart of Davy Jones," I was very excited to revisit "At World's End" once he'd had a crack at it. I am happy to report that, for the most part, he has once again given us a worthy successor to the delightful first "Pirates of the Caribbean" movie. All of my problems with "Dead Man's Chest" (terrible color timing, overstuffed narrative, action set pieces that go on waaaaay to long) not only reappeared for "At World's End," they were even worse. The strongest memories I have of watching the theatrical cut of this movie, in fact, are of not knowing what the hell is going on and wondering why everything needed to be green. In TM2YC's version, the narrative moves logically from one plot point to the next, without constantly cutting back and forth between scattered characters, making it a lot easier to keep track of everyone's disparate motivations. The colors are vibrant and the shadows deep, highlighting the fantastic design work on display. Loads of lazy comedy is cut, leaving only the good stuff. The interminable battles are trimmed way down. Simply stated, it's focused, fun, and a far cry from its source material. I watched the HD MP4, and it looked and sounded generally terrific. TM2YC experienced some software issues getting this edit to us, and as a result the picture doesn't quite measure up to the previous installment's pristine presentation. However, aside from some crushed blacks in the Shipwreck Cove scene, I barely noticed the slight drop in quality, certainly not enough to dock any points. I experienced no issues whatsoever with the audio. The editing was near flawless; I only noticed one errant frame during a single transition, and I didn't notice any audio edits at all. The only problem I had with the edit itself was, once again, with the title. Captain Jack Sparrow still feels like a side character to Will and Elizabeth's central story and thus doesn't really earn the Indiana Jones-ing of his name in the title. Also, and more problematically, the titular "song of the brethren court" doesn't really earn its place either. Character's refer to the song being sung more than once in the film, and Elizabeth sings it to herself in Singapore. However, I got the sense that the song to which everyone is referring, the one that gets the plot moving and the pirate lords assembled, is the one sung at the gallows in the now-excised opening. I understand the desire to remove this scene, upsetting as it was, but without the pirate-anthem-as-rallying-cry sequence, the "song" doesn't loom as large. I enjoyed this edit quite a bit. 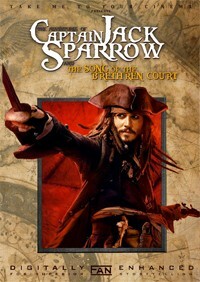 It's a huge improvement over the source material and a fitting close to the original "Pirates" trilogy. I didn't have quite as much fun with it as I did "...The Heart of Davy Jones," but my remaining problems with the film are at the script level and are no fault of the editor.